Many patients with TMD have less pain when chewing on the involved side due to less compressive force on that side during the chewing motion. Several studies indicate that 25% of the population suffers from TMD. Up to 70% of the patients with TMD have disc displacement. The number of teeth and their position can increase or decrease the force of a person’s bite. If you have jaw pain, seek the advice and treatment from a Physical Therapist. If you suffer pain in your jaw, face, neck and shoulders when you when you open your mouth to talk or eat, you may be suffering from a temporomandibular joint disorder (TMD). Sometimes this pain is referred to as TMJ but that only refers to the joint, and TMD is actually a joint disorder that can cause pain, difficulty in opening and closing mouth and a clicking or popping sound when moving the jaw. This condition affects more women than men in the age range of 20-40 years old. The cause of the pain may not be known, but Physical Therapists and other healthcare professionals can usually treat it. 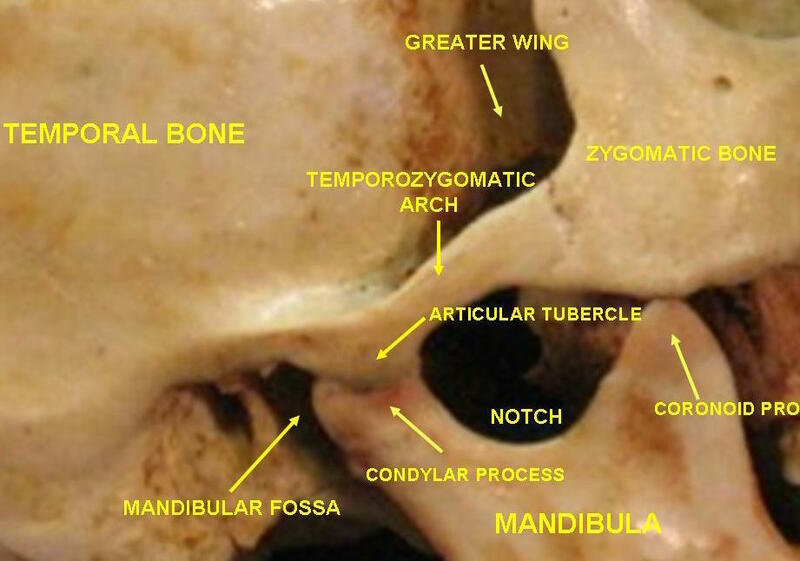 The Temporomandibular joint or TMJ is a hinge joint that connects the jaw to the skull or Temporal bone immediately in front of the ear. The joint is comprised of a ball and socket with a cartilage disc in the middle. The disc absorbs shock and dissipates force throughout the surface of the socket. The joint is held together with ligaments and moved by various muscles that attach to the neck or skull. The movement of the ball in the socket involves the translation of the ball over the disc material. If the disc is damaged or the muscles or ligaments “pull” the joint into an abnormal position, the joint can become inflamed and not function properly. This is commonly referred to as TMJ or TMD. “Temporomandibular joint” by Anatomist90 – Own work. Licensed under CC BY-SA 3.0 via Commons . The symptoms are numerous and not all appear with every incident of TMD. The symptoms might be pain on the side of the head near the ear, tooth pain, clicking and popping every time the mouth opens and closes, limited opening of the mouth and possible “locking” of the jaw. One or many can occur if the temporomandibular joint is irritated in any way. Many times a patient will go to their doctor with a complaint of ear pain, and it is diagnosed as a TMJ problem. Grinding of one’s teeth, stress, malalignment of the jaw/teeth, trauma and arthritic changes are a few of the more common causes. While the possible causes are numerous, the actual cause is rarely known. The treatment of TMD is similar to any other joint: inflammation must be controlled. The inflammation process causes pain, and it eliminated in order to restore normal function of the joint. If there is an anatomical malalignment or damaged disc, specialized dentists and oral surgeons might prescribe the use of a special mouth guard or splint, but rarely suggest or recommend a surgical procedure. Physical Therapists can treat any of the symptoms of TMD. There are a few Physical Therapists who specialize in the treatment of TMD, but the symptoms can be addressed by any Physical Therapist. The treatment of this joint consists of the use of modalities such as ice, heat, ultrasound, electrical stimulation and laser therapy. The therapist might have to perform manual therapy on one or both temporomandibular joints to address a possible restriction in motion. The capsule, ligaments or muscles surrounding and controlling the joint (s) might not be functioning properly and the use of a manual technique can stimulate the proper function to return. The therapist will prescribe a set of exercises that will help to stretch and strengthen the muscles that control the joint. The restrictions to motion due to tight joint structures and can also be treated with exercises. They will suggest changes in your eating habits and lifestyle if necessary to prevent more irritation to the joint. TMD or TMJ dysfunction can cause a great deal of discomfort and pain on one or both sides of the jaw. The joint is complex and not easily treated but the symptoms can be controlled in most instances. Patients will most likely need to adjust their eating habits, take over-the-counter anti-inflammatory medication and perform specific exercises to stretch and strengthen the muscles and other soft tissue structures of the involved joint.